Q. Where does Chocolate come from? Is it true that it grows on trees?! A. You bet it does!! The cocoa tree grows in tropical climates where it is consistently warm and very humid. Cocoa beans, which are the main ingredient of chocolate, are seeds found within the cocoa tree’s fruit pods. After harvest, the cocoa beans are first fermented, then dried, then roasted or grilled, and finally cleaned and ground down before the cocoa liquor is extracted. Gary, for a more detailed description of this cultivation of cocoa tress and process of creating chocolate, see Chocolate Cocoa Beans and History… it’s a fascinating and succinct history of chocolate, covering over 3000 years! Q. I’ve heard that you should never store chocolate in the refrigerator… is that true? A. Over all I would agree with that, Harriett. Ideally chocolate likes cool temperatures, and a dark place with good air circulation. It is important to keep chocolate away from bright light. If it’s stored in this manner at 65°F and 50% humidity, unsweetened and dark chocolate will last for 10 years! In a typical kitchen, you can count on up to a year for dark chocolate, and or 7 to 8 months for milk and white chocolate. It’s true, the refrigerator in not recommended, but if you lived in a hot, humid climate, you might not have any other choice. It’s important to wrap chocolate well to protect it from odors… first in foil and then in plastic. When you remove it from the refrigerator, let it come to room temperature before unwrapping it. This will prevent moisture from condensing on the chocolate and creating "sugar bloom" [the sugar rises to the surface and crystallizes forming grey to white streaks]. Some people [not me] freeze Truffles, Pralines, and other confections coated with chocolate. If you do this Harriett, defrost them in the refrigerator, and later bring them up to room temperature before serving them. All confections are much better if they are not refrigerated and are eaten within a month, since fine chocolate is made without preservatives. Q. Is there really a big difference in expensive chocolate, or is it just great marketing? A. Yes, there can be a big difference, Amy. Some inexpensive chocolates are blended with wax! Most bakery "chocolate products" have very little, if any, "REAL" chocolate. They contain mostly "sugar" and "partially hydrogenated palm oil." Expensive chocolate should reflect the quality of the ingredients, which includes high quality cocoa beans as well as other ingredients. No preserving agents or vegetable fats (other than cocoa butter) are employed. Sugar, which is also a preserving agent, should only be used in moderation. 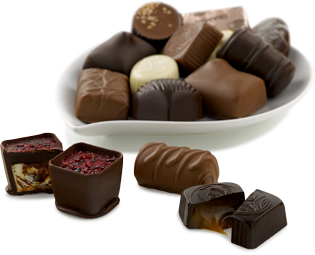 Some chocolates are made from one kind of bean, but most are a blend of several kinds of beans. Fine chocolate has a greater percentage of cocoa butter, and will be more extensively refined. There are many different processes that can be used to manufacture chocolate. The quality of the final product depends not only on the care provided to the cocoa trees, and to the harvesting process, but is also greatly influenced by the degree of care exercised throughout the entire manufacturing process. Fascinating stuff, isn’t, Amy! Of course, the expertise of the hand work, and the chocolatier’s personal creativity is also important… fine chocolate making is truly an art. Plan to visit culinary shows where the finest Chocolatiers show off their art... you can probably find one in LA. They are amazing, and Amy, you will never forget the experience! Check out this website for a preview. NEW YORK (CNN) -- Scrumptious fashions, including a corset that melts in your mouth and pearls you can eat one by one, were unveiled this week at a special preview of the Chocolate Show. The edible styles are part of a special exhibit featuring 12 dresses made in chocolate by famous designers. Dark, light and white chocolate are shaped into evening wear, jewelry -- even a wedding dress for the candy show. Sponsored by Le Salon du Chocolat in Paris, the show is designed to let the public taste and buy chocolate products as well as view chocolate art and other exhibits crafted by renown pastry chefs from around the world. The show features chef demonstrations and chocolate testings set to the music of bands from cocoa-producing countries. Q. Are all Chocolate Trees alike… or have they genes evolved into different "races?" A. Good question! There are several different kinds of "Chocolate Trees," Andrew. And even within one kind of tree, there will be many variations. Like wine grapes, cocoa beans are a direct reflection of the quality of the soil and the climate in which they are grown… they develop different characteristics when grown in different regions. The Criollo Bean Rules! The criollo cocoa bean possesses a complex, fragrant and nutty flavor, and it produces the most prized chocolate in the world. These rare beauties love the humid climate of Central and South America, but the criollo trees are very fragile, and require lots of TLC. There have been no new plantings for the past 50 years, outside of Venezuela… another reason why the best chocolate is more expensive. The Forastero Bean is Prolific. The forastero bean is far more abundant, because it’s easier-to-grow. Although this bean lacks the aroma and delicacy of the criollo, it accounts for about 90 percent of the world's production… the source for most commercial chocolate. The Trinitario Bean is a Good Compromise. The third variety, trinitario is a cross between forastero and criollo. It is prolific and sturdy with flavorful beans. Q. So just how do these magic beans turn into melt in your mouth chocolate? A. Mavis, there is no easy answer to your question, but I’ll try to give you a brief overview of the process. The beans are roasted in a large, rotary cylinder at low heat, for 30 minutes to two hours. The specific aromas, flavors, and rich brown colors that develop, depend how long and at what temperature they are roasted. The outer shells are removed, and the beans are cracked into small pieces known as nibs. The nibs are heated again and ground into a fine paste. Then when this paste is pressed, it yields cocoa butter and the chocolate liquor. If you add milk solids, sugar and vanilla to this cocoa butter you get white chocolate. This of course is not really chocolate because it contains no chocolate liquor. Chocolate liquor at this stage is a paste made of the nonfat solids from the nibs, as well as some of the remaining cocoa butter... maybe 10 to 20%. Chocolate liquor remains solid at normal room temperatures, but liquefies at about 92 degrees. Now think about it… that’s about the same temperature of the human tongue … which is the secret behind chocolate's cherished melting qualities! The chocolate liquor must be finely ground in order to give it that "mouth watering smoothness" you mentioned. Cocoa butter is often added back into the liquor along with sugar and other ingredients, such as milk, vanilla or lecithin. The additions of these and other ingredients determine chocolate flavor and type... the spectrum being, very dark semisweet all the way to milk chocolate. When pure chocolate liquor is poured into molds, cooled and hardened, it becomes what we know as unsweetened chocolate. If chocolate liquor is pulverized, it becomes unsweetened cocoa powder. The blended mixtures are kneaded in large, heavy machines that agitate and aerate the chocolate to create a smooth texture and well rounded flavor. This process, called conching, can take as long as six days. Invented more than a century ago, conching helps reduce acid levels, allowing pleasant flavors to develop. Finally, the chocolate is poured into molds and carefully cooled and packaged. The culmination of this process results in a finished product that is really only the starting point for fine Chocolate Artisans. Yup… that about sums it up, Mavis, but I encourage you to read more about the different manufacturing processes, because it will enable you to better appreciate fine chocolate. Viva la Difference!! Q. Some of the chocolate I was saving for baking looked strange when I unwrapped it, so I tossed it out. What causes chocolate to spoil? A. Technically the chocolate was probably not spoiled, and may have been fine once it was melted. If Chocolate is exposed to heat during storage, it will bloom … fat bloom appears as gray to white spots on the surface of the chocolate. This discoloration is cocoa butter that has softened and come to the surface. The taste will not be affected, but the interior will be more dense. If you use this chocolate for baking or cooking, the cocoa butter will blend with the rest of the chocolate. If you live in a warm climate ask for a double bag or an insulated ice cream bag for your chocolate. Personally I, and other aficionados I know, keep a small Styrofoam box on the floor of my car. If your chocolate was too damp, you may incur sugar bloom, which leaves the chocolate feeling rough, and this is not good for making fine candy. Q. Does Chocolate improve with age, like wine? A. A few years ago, I was touring a chocolate manufacturing plant that produced a very high quality product. At the end of my tour, the President gave me a ten pound block of their finest dark chocolate. [I had to hire a porter to carry it!] He said that, somewhat like wine, fine chocolate improves with age! And that this chocolate would reach its quality peak in seven years. Q. How did mole evolve … I’ve heard it came directly from the Aztecs? A. As I have heard it, the Nuns in Puebla Mexico were notified at the last minute of an impending visit their Bishop. They took stock of their pantry, slaughtered a turkey, and created a sauce by combining unsweetened chocolate, chilies, onion, nuts and sesame seeds. That sounds pretty close to the Aztec recipe for chocolate… pulverized, fermented, roasted cocoa beans combined with water, chilies and other herbs. Q. I seem to crave Chocolate… is that my imagination? A. You crave it. I crave it. Most of us do. And chocolate is a food that's in a category by itself. Chocolate, like coffee and tea, has an unusual capacity to interact with brain chemistry. According to Adam Drewnowski, who directs the Human Nutrition Program at University of Michigan in Ann Arbor, chocolate normally triggers the production of opioids. Drewnowsk found that when he chemically blocked receptors for opiate chemicals, people decreased their consumption of high fat chocolates by more than half. He says, "Our research indicates that opioids are most implicated in the craving for high-sugar, high-fat." Q. How is White Chocolate made? Is it really chocolate? A. 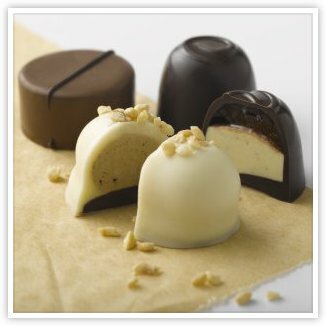 After World War I, White Chocolate was introduced by the Swiss. It is more expensive to produce than dark chocolate since it contains more cocoa butter. The cocoa butter gives White Chocolate a subtle hint of chocolaty taste, then it is combined with sugar, butterfat, milk solids, lecithin and other flavorings. It contains no chocolate liquor and gets its ivory color from the cocoa butter. According to FDA standards, real chocolate must contain chocolate liquor (the solid that results from finely grinding cocoa bean nibs). For years, The U.S. barred manufacturers from calling this product "chocolate" as it is called in Europe, and so it may be labeled confectionery coating or summer coating. If the "white chocolate" looks bright white, not ivory, it probably doesn’t contain cocoa butter. They may have substituted a mixture of other vegetable fat. Q. How many beans does it take to make a pound of Chocolate? A. Great question Charlie… It takes approximately 400 cocoa beans to make 1 pound of chocolate. Annual world consumption of cocoa beans averages approximately 600,000 tons. Q. How much Chocolate does the average person eat… I always want to be better than average? A. In the early 1990's, annual U.S. production of chocolate and related confections exceeded 1.2 million metric tons. Annual consumption in the U.S. is about 11.3 pounds per person. In Switzerland, it is more… 21 pounds of chocolate per person. Q. Please tell me there are antioxidants in chocolate so I don’t feel so guilty when I sneak just one more piece! A. Maria, don’t feel guilty about enjoying yourself… life is soooo short!! I have some good news that may help you to relax and allow yourself to indulge a bit. According to a study by researchers from Harvard University published in the December 1998 in the British Medical Journal, antioxidants in chocolate and other candies may well be good for the heart! The study, involved 7,841 male graduates of Harvard. Those studied included men at an average age of 65 who were followed for five years. It was found that men who ate up to three candy bars a month, had a 36 percent lower risk of death compared to those who did not eat them. Also, men who reported consuming three or more sweets a week lived longer than those who ate none, the decreased risk of death was 16 percent. Q. When the label says Dutch processed cocoa powder, what does that mean? A. All cocoa powder is made from chocolate liquor that has nearly all the cocoa butter removed under pressure and then is ground into powder. Compared to other chocolates, cocoa powder is considered low in fat, but still contains 22 % cocoa butter. Dutch processed cocoa powder, has been treated with a mild alkalizing agent such as baking soda to produce a mellow tasting, darkly colored cocoa. For best results, use the type of chocolate indicated in the recipe. Q. If I join The Gourmet Chocolate of the Month Club, am I going to get fatter and clog up my arteries? A. While Chocolate can be classified as health food, there is no need to ban chocolate from a healthy diet. Cocoa (powdered, roasted cocoa beans from which a portion of the fat has been removed) is used in most desserts and it’s only 15% fat. Milk chocolate has 30% fat and bittersweet chocolate has 35% fat. Chocolate is considered a complementary food, since it contains all three organic substances, although not well balanced: carbohydrates (starch, diverse sugars), fats (cocoa butter), and vegetable proteins. Minerals can also be found in chocolate: potassium and magnesium in large amounts, calcium and sodium in small amounts, and iron in trace amounts. Chocolate also contains vitamins A1, B1, B2, D, and E.
Health-conscious chocophiles owe a debt of gratitude to medical researcher Scott M. Grundy, M.D., Ph.D., director of the Center for Human Nutrition at the University of Texas Southwest Medical Center in Dallas, who found that stearic acid, the principal fat in chocolate, does not raise LDL cholesterol levels. Hope that satisfies your concerns, now join the club and satisfy your sweet tooth! Your’re going to fall in love with our club! The Marquis de Sade became proficient in disguising poisons with Chocolate. Q. Chocolate has been called an antidepressant, tonifier, stimulant, euphoriant, and even aphrodisiac! What does science say? A. Chocolate is exceptional high-energy food relative to its small volume. It is considered a food that promotes effort whether intellectual or physical. Chocolate’s chemical composition includes carbohydrates (starch, diverse sugars), fats (cocoa butter), and vegetable proteins. Minerals can also be found in chocolate: potassium and magnesium in large amounts, calcium and sodium in small amounts, and iron in trace amounts. Chocolate also contains vitamins A1, B1, B2, D, and E.
Theobromine stimulates the central nervous system and the appetite, facilitates muscular activity, and has diuretic and a cardiotonic effect. Caffeine increases resistance to fatigue, enhances intellectual activity, and increases watchfulness. The amount of caffeine in one chocolate bar is about a third of the caffine in a cup of coffee. Phenylethylamine has a chemical structure similar to amphetamines and contains psycho-stimulating properties. Chocolate contains the highest concentration in any food of phenylethylamine, which is the chemical produced in the brain when a person is in love. Phenylethylamine combines with dopamine to produce a mild antidepressant effect. All of these stimulants increase the activity of neurotransmitters (brain chemicals) in parts of the brain that control our ability to pay attention and stay alert. Serotonin is a neurotransmitter (substance freed by the nerve endings) in the cerebral cortex. Its quantity is often found to be lower during certain nervous depression states. The serotonin found in chocolate helps correct its initial loss. Caffeine and saccharose stimulate the body's stimulation of serotonin. Q. Are there specific standards behind the definitions of different kinds of chocolate? A. The FDA sets standards. For instance bittersweet chocolate, sometimes called semisweet in America is a dark chocolate, and contains at least 35 % chocolate liquor (unsweetened chocolate). Individual manufacturers can add more chocolate liquor, sugar, additional cocoa butter, milk solids, lecithin and flavorings, such as vanilla. 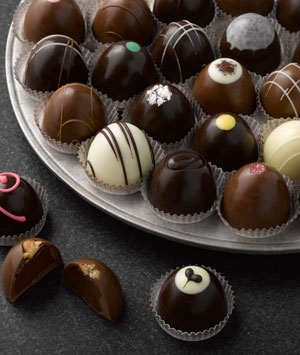 You need to experiment to discover your favorite types of chocolate. Q. Why is Some Chocolate called Milk Chocolate? Mouthfeel – Fine milk chocolate feels creamy and melts smoothly across the palate. Again, the extra fine creamy texture is achieved by conching ingredients. Q. Is there any new and interesting research about Chocolate? A. For over 3000 years, people have claimed to experience pleasant effects after eating Chocolate. Scientists know that chocolate contains more than 300 known chemicals, and they have been working on isolating specific chemicals, and chemical combinations, to explain how these chemicals affect our brains. I talked to Emmanuelle diTomaso, who worked on the original study in San Diego (she's now a researcher at Harvard), and to Daniel Piomelli, a neuropharmacologist with the Neurosciences Institute in San Diego. Dan heads the project and continues to do research at the Neurosciences Institute. In 1996, scientists announced that brain cells have a receptor that binds with THC (tetrahydrocannabinol), the active ingredient in marijuana to make us feel high. A receptor is a structure on the surface of a cell that can lock onto certain molecules, making it possible to carry a signal through the cell wall… diTomaso described it as a "lock-and-key" system. "The active compound," she told me, "will lock itself to the protein on the membrane of the cell, and that triggers a reaction inside the cell." In the case of THC, that chemical reaction is what would make someone feel "high." This is getting a little complex for me! Danielle Piomelli’s research indicates that chocolate slows the destruction of chemicals that activate a marijuana high. Our brains naturally produce a chemical that also binds to this same receptor and produces effects similar to those of THC, Piomelli explains. "Everything feels better, your perception of time changes -- five minutes can feel like an hour. It's a pain killer in experimental animals." The natural chemical is called anandamide, and Piomelli says it's a "reasonable speculation" that it may play a role in feelings of euphoria. Anandamide, like other neurotransmitters, is broken down soon after it's produced. Piomelli's recent experiments indicate that two chemicals in chocolate inhibit the natural breakdown of anandamide. In other words, chocolate could preserve a natural high brought on by whatever caused the release of anandamide in the first place. Daniele Piomelli and his coworkers believe could provide therapeutic insights into treating a host of ails, including depression. [Tomaso, E.d., M. Beltramo, and D. Piomelli. 1996. Brain cannabinoids in chocolate. Nature 382(Aug. 22):677. Q. Will chocolate give me more cavaties and make my face break out? A. Chocolate contains a protein that inhibits bacterial growth on teeth, and since it melts at body temperature and melts off of teeth, the sugar in chocolate does not cling to teeth. Apparently Mother doesn’t always know best… It’s a myth that chocolate contributes to dental decay. A study of 3000 thirteen year old Scottish children, classified by the amounts of "real" chocolate they ate, found no correlation between chocolate and dental decay. This study was further supported by research at the Eastman Dental Center in Rochester, New York, in which milk chocolate and chocolate chip cookies were found to be among the snack foods contributing least to dental decay. Also, extensive dermatological studies have discovered no relationship between chocolate and acne. But to be perfectly honest, I am sure I get a pimple or two when over indulge… perhaps it’s the fat in the chocolate?